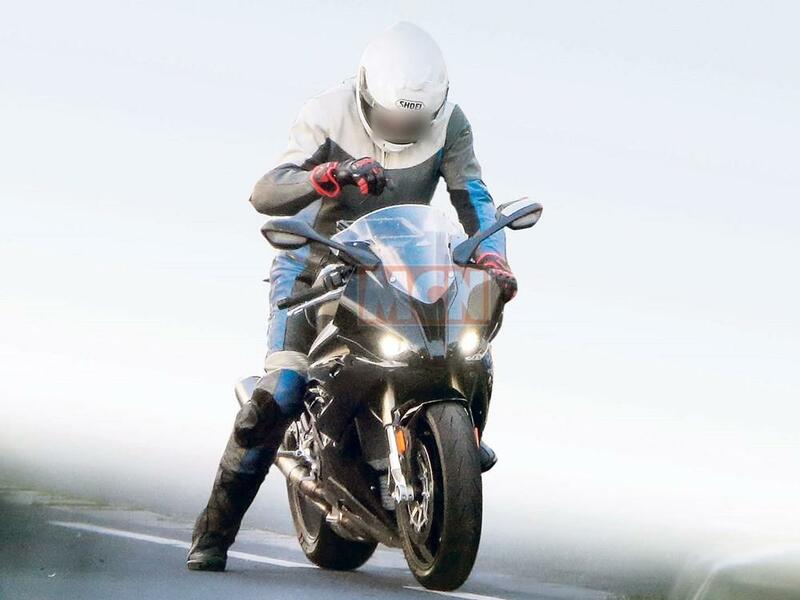 This BMW S1000RR image was leaked along with statistics about the 2019 model. 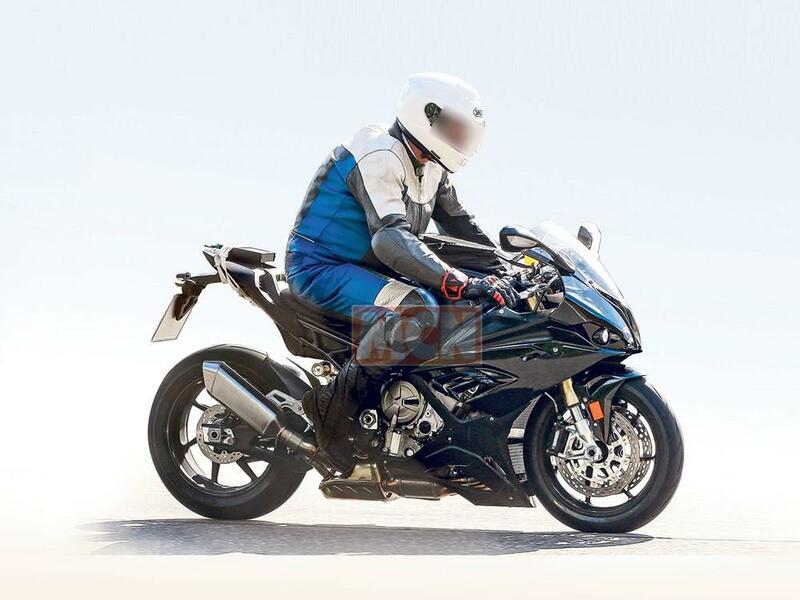 An image has appeared online apparently listing the full spec of the 2019 BMW S1000RR which is set to be officially unveiled at the EICMA motorbike show next week. 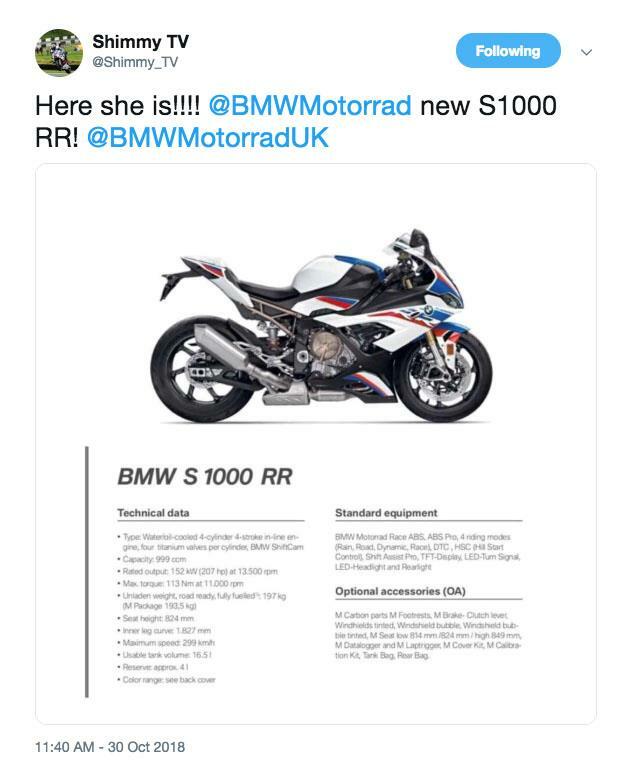 BMW had previously teased what looks to be the new S1000RR in a short clip on their social media channels. There's not a lot to say about the short clip in which a bike flashes past a static camera too quickly to see anything with the strapline: "Heads up... adrenaline incoming." BMW shocked the superbike establishment a decade ago when they launched the original BMW S1000RR. Now they’re about to do it all over again when they unveil next year’s version. Officially, you’ll have to wait until the Intermot show in Cologne this October to see the bike, but these CAD images, taken from the company’s official design patent for the 2019 S1000RR, clearly show all the main details. There’s a lot to take in, but it’s abundantly clear that this is a completely new design. The engine, frame, suspension and bodywork have been designed from scratch with the clear intention of making this a huge leap forward from the current S1000RR. BMW’s rivals should worry. The engine’s still an inline four, but all the visible castings are completely new, so it’s not simply an evolution. More power is guaranteed, and that means well in excess of 200hp. The chassis is also new, and clings much more closely to the engine than most beam frames. Its rails gain an unusual zig-zag shape as they go over the transmission and then turn up to follow the angle of the cylinders towards the headstock. The intention appears to be to make the bike more compact than ever, and it certainly looks small in these pictures. At the back, the swingarm is braced from underneath rather than above. That’s standard practice in MotoGP, but unique among the current crop of 1000cc road-going superbikes. Normally, the bulky exhaust collector box below the front of the swingarm means designers use bracing that runs above the swingarm instead. It’s impressive that BMW has managed to squeeze it all in without making such compromises, particularly since it’s got a smaller end-can than the current S1000RR, and is surely designed to meet 2020’s Euro5 emissions limits. When it comes to styling, it’s all change. Notably, BMW has dropped the lopsided headlights that have been an S1000RR trademark for a decade. In their place is a pair of matching LED lights in a symmetrical nose. The central air intake does hark back to the old bike’s design, giving a smidge of continuity. BMW is about to rip the superbike sector apart with a major makeover of its S1000RR. Since the sports missile landed in 2010 the Japanese and Italians have been busy catching up. The playing field is now flatter than a bowling green, but it looks like that could all be about to change – first with Ducati’s new V4 next year, then the arrival of this new S1000RR in 2019. The 2017 Honda FirebladeSuzuki GSX-R1000 are certainly impressive, but neither are ground-breaking. Over the next two years we expect a new ZX-10R and R1, while Ducati’s Panigale-replacing V4 superbike is currently the worst kept secret in motorcycling. But who would bet against this ground-up brand-new BMW S1000RR being the most radical? This prototype looks so fundamentally different to the existing bike. It looks tiny. The wheels are standard (current) 17in S1000RR rims, and the reduction in physical size is clear. The wheelbase, however, is close – possibly even identical – but the genetics that deliver it are radically different. The tail unit is a lot shorter than the existing bike’s and will offer only the smallest of perches for a pillion. The LED indicators also appear to contain the rear lights – each clearly glowing red in our spy shots. Whether this will be a production solution is unclear. The stubby tail unit sits atop a completely new subframe that is now of tubular construction. There are some big changes at the front, too. The love-it-or-loathe-it asymmetrical face is gone. While the intricate fins and layered fairing panels are a clear evolution, the face is a dramatic departure. As well as complete frontal symmetry, there’s a pair of dazzling LED projector beam style eyes each side of a familiar-looking large central air intake. Gone too are the fairing-mounted indicators, relocated in the mirrors instead, and the main side panels have also shrunk. The rider’s view is dominated by an enormous new flatscreen dash, a full-colour high-def TFT item. It’s fair to assume the RR will support functionality for adjusting everything from fuel maps to suspension settings and rider aids, while also boasting a suite of display styles to suit personal preferences. We’d also expect the RR to have the latest evolution of everything currently available, while mobile connectivity will be a must, and it will doubtless include satnav functionality. There is also a completely new engine. Some elements have simply swapped sides compared to the current mill, while the position of other elements, like the water pump, have been completely relocated. While the fundamental architecture remains, the crankcases, heads, and most of the auxiliaries are completely different. We wouldn’t rule out the new RR having a counter-rotating crank to help its on-track agility – something that would also explain the apparent reversal of some engine features. It’s also certain to be Euro5 compliant, ready for the new emission laws in 2020. So this should be a 205bhp+ package with a serious reduction in mass to give a huge performance boost. The exhaust system is fascinatingly small. Bigger exhausts are a reluctant by-product of recent emissions laws, but clearly BMW have found a way to clean up the combustion cycle in order to run with such a small system. The chassis is all-new, too. The fork looks identical to the existing model, although the monoblock calipers are unrecognisable, although the rear appears to be the current Brembo item. The rear shock and swingarm are completely new. With no visible adjusters, the shock is clearly electronically controlled, suggesting it’s the latest evolution of the firm’s Dynamic ESA. 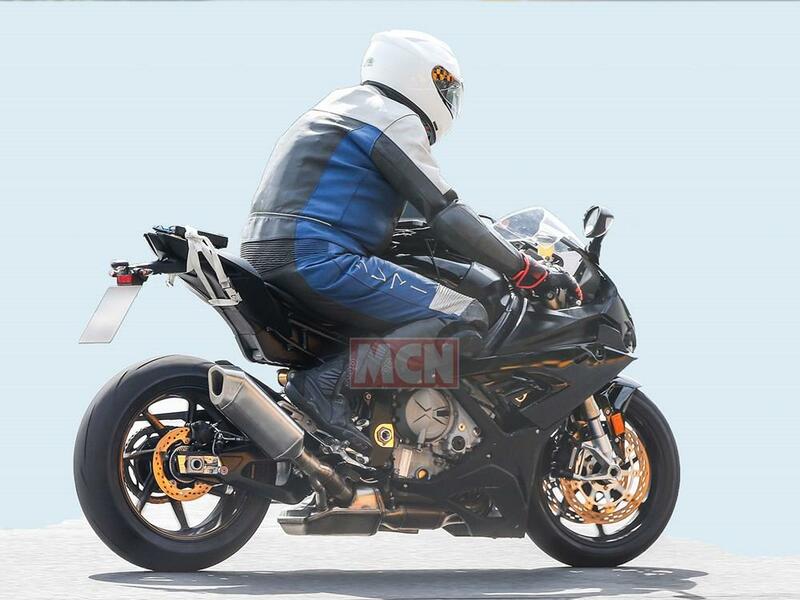 The swingarm is now an underbraced item and the shock moves from a canted forward location to a bolt-upright, more rearward position very close to the rear wheel, made possible by the flipped swingarm design. The main frame is also a radical departure. Still clearly an alloy frame – not the anticipated carbon frame from the HP4 – it appears that the two large frame spars are replaced by a more convoluted series of sections, to offer more deft chassis tuning for track use. What is clear is that it is neither carbon, nor a monocoque design. The test mule looks remarkably well finished. There’s not much black tape or missing/bodged parts, which all point to this bike being close to production. Nonetheless, MCN’s sources suggest the very earliest a production version will be officially revealed is mid-to-late 2018, and that it will replace the current model as a 2019 cat amongst the racing pigeons. The four-cylinder S1000RR engine has found its way into other areas of the BMW range in recent years – supplying the massively popular (and important to BMW) S1000R naked hooligan, and S1000XR adventure sport bike. Both will undoubtedly also benefit from the all-new engine – but not just yet. With the new RR expected to arrive in 2019, we wouldn’t anticipate the R or XR getting their own retuned versions until 2020, falling neatly in line with the introduction of Euro5, something which the current S1000 engine hasn’t been designed to meet. Find a previous version of the BMW S1000RR for sale. BMW S1000RR launch: One day to go!